The Face of Atlanta, right? The Savior. The cure of the rebuild. The Commodore that will bring us back to prominence. Wait, he was promoted after 377 PAs above A-ball? And those PAs included a triple slash of .261/.342/.402? That can’t be right. Could there be a single player that best personifies how uncertain the 2018 season is? The projections are all over the place from fans, analysts, Vegas, etc. And from the fan perspective, it probably says more about who you are than anything when you look at the season itself. And with Dansby, it’s not much different. All told last year, Dansby limped to a 0.1 fWAR in an almost full season of 144 games and 551 PAs. I think we all, Dansby included, wish we could forget his season ever existd. The season started with Dansby appearing on GIFs, TV commercials, random promotional materials, and just about everywhere else the Braves could use his lovely locks and boyish good looks to promote their new stadium. And it may have worked, but just not for the player. It’s hard to put yourself in the shoes of a 23-year old, but could you imagine being in such a spotlight having accomplished what was tangibly a small resume of professional success? Looking back, it’s not surprising to see how things went. He struggled with mechanical adjustments. His back leg, even as of this Spring Training, still flies back when he swings. He kicked in the field (20 errors for a .965 fielding percentage). He didn’t steal many bases (3 stolen bases in 6 chances). His .232/.312/.324 triple slash is not unpredictable for a 23-year old rookie, but I think we all hoped for more. The Braves certainly did, and they sent him down in July to work on his swing. But like Jeff Francoeur‘s demotion, who was another local hero with a million dollar smile, Swanson’s demotion didn’t last long after Johan Camargo tripped taking the field and turned his ankle. When you consider how Dansby’s season went and the benefit he could have had for a little more time at AAA, wasn’t that just his luck? But the talent is there, so it’s no surprise that the projection systems like him to improve his showing. Depth Charts sees a 1.5 fWAR season, Steamer is at 1.3, ZiPS 1.7, and Fans is the most optimistic with a 2.6 fWAR season. So what is a realistic but optimistic season outlook for Dansby? How about Brandon Crawford‘s 2017 season: .253/.305/.403 for a 86 wRC+, above average defense, minimal stolen bases, which brings you to a nice, round 2.0 fWAR. What if he hits .300/.349/.427, steals 22 bases in 30 chances, and plays average defense? Then you’d have Jean Segura‘s 2017 season, good for a 2.9 fWAR production. Would anyone be disappointed to see the difference split? If he could put in a 2 fWAR season along with Ender Inciarte‘s typical 3 fWAR season, that will certainly be more than what Shelby Miller will accomplish this year. It may not ever be enough in some people’s eyes (hey, coop! ), but if Dansby Swanson can put up a career similar to Jeff Blauser‘s (19.7 career fWAR with a short peak), I think we can all be happy. After all, isn’t he adorable? Peterson is largely worthless as a trade piece for even a live arm until he can be healthy and put in a season remotely similar to his 2016 season where he slashed .282/.343/.431 at 21 at AA. He’ll be 23 this year, so while he may not figure into the Braves’ plans with Ender, Acuna, Pache, and a ton of money to spend, he could rejuvenate his value and be a substantial piece of a trade for a major leaguer. He just doesn’t look good right now. in search of the metaphysical. This is a rather amazing read, as abstracts of academic papers on baseball go. Hey Rob, average defense would be wonderful! A .700 OPS would delight! I hope but doubt. The Braves are now averaging 9 runs per game during spring training when Dansby leads off. Even though he went 0 for 3, this has to mean that Dansby should lead off for the rest of the year. On this Sunday as so many others Dansby still looks as though he should be in the Hamptons sheltering inside from the Nor-Easter and planning the evening’s dinner party. Andrelton he ain’t, Gatsby he might well be. EDIT: Apparently it’s behind a paywall. Sorry. mine, i never could get to swerve. a first round draft choice out of S.M.E.R.S.H. said Putin, told you, typical Braves, you had my warning. He was simply optioned to Gwinnett, not DFA’d. Though I don’t think many people would have cared if he were. Yes…poet’s anticipation…i vaguely remember the difference. Wright to minor league camp- that’s not a demotion, correct? He is expected to start at Double A as he ended last season in A+ ball. Should have tagged this post with a pic of Charlie Culberson. Is it weird that there are 1/10th of the comments when actual games are being played? AA signaling that our shortstop of the future could be Dansby, or it could be Camargo. @16, I’m staying out of the Dansby-centric fray. All you can do is “wait and see”. I did listen to yesterday’s game while driving home…sounded like Acuna hit a line drive that literally knocked the Marlins SS to the ground. I’m also rooting for the new svelte Aaron Blair – he’s taken a lot of guff on Braves forums, way more than Dansby. I didn’t know Dansby had missed so much time in Spring Training last year. Hype, hype, hype, hype. How did we go from all of this to “meh, maybe he’s a little better than minor league journeyman Johan Camargo”. If people were reactive last year, I feel people are being reactive this year. He’s not a superstar, but he’ll be a productive regular, and we don’t know that yet about Camargo. It’s one thing if it’s fans or the media saying it, and it’s another when the GM is subtly keeping the door open for non-Dansby possibilities. Wait…is impatience with the rebuild now the contrarian position? :) I like that AA is moving towards, “Train’s leaving the station, Dansby. We’ve got places to be.” However you feel about Dansby himself, it says good things about where we’re at overall. I suspect a year from now there will be change of scenery talk swirling around The Salad. I’m sorry, but this is just silly. He was the centerpiece of a trade where we traded an elite starting pitcher with years of control, he was a consensus top-10 talent in a draft THREE years ago, and he gets 550 major league PAs after getting only 370 PAs? Just get out of here with this. You can make a lot of parallel arguments for Blair, and I think he also has not been managed as well as Soroka, Allard, Wright, Touki, etc. have been. If he puts in a solid spring, he should get a look for a roster spot. @22 I’m assuming you’re talking about me? I have a feeling that the Braves are less sold on him being ‘of value’ than perhaps you are. As krussell said, time will tell. Dansby was rushed, but I think they thought he could handle it. I think if they had not rushed him, he would have been moved to second base. We will see. I think he can turn out okay. Braves traded for some Camargo insurance and got Ryan Schimpf from the Rays. He’s an all-power, low-BA third baseman who is 29 and has been largely replacement level for the Padres. I hope we doesn’t find his way onto our roster. They also outrighted Josh Ravin to AAA. He was one of the two they picked up from LA the night before the Rule 5 draft. So the bullpen is getting a little clearer. Players like Schimpf get overlooked because of low batting averages. He’s generated 2.1 WAR for his career over 441 ABs. I hope he can contribute to the team. Left-handed power hitters might do well in Suntrust! @30 I like acquiring Schmipf – he’ll end up costing the Braves very little in trade and salary, and he could be a useful bench piece (with some starts at 3B against right-handed pitchers thrown in as well). I agree. I am glad they obtained him as the 25 man roster really doesn’t have anyone like him as a bench piece, IMO. 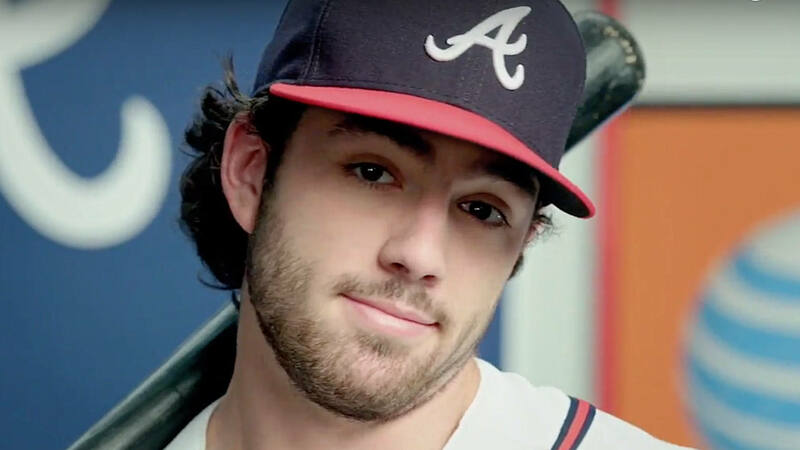 Have you guys figured out the whole “was Dansby worth it” thing yet? @33 The investigation is ongoing. If Schimpf hits like he did in 2016, then he’ll be a really good fit for our roster. If he hits closer to his 2017 production, then he’s AAA filler. The Rays have a ton of left-handed hitting infielders, so I can see how he doesn’t fit there, but if you’re talking about a power-hungry team needing a boost, that would certainly describe the Rays too. What’s to lose? I hope he doesn’t split his 2016-2017 production and find his way on our roster over someone like Ruiz who already has close to 1,000 PAs at AAA. Ryan Schimpf makes Kala Ka’aihue look like Barbaro Canizares. @33, Does being head of Braves Journal give Rob the power to subpoena Dave Stewart? Sure, what else does Stew have on his dance card? Schimpf is probably a good move. If somehow he could learn consistency he could be decent. Batting averages in AA and AAA since 2012 are: .279, .210, .270, .189, .271, .200, .355, .202. If the guy can hit .250 with his power and on base skills he could be pretty useful. The problem with Schimpf is that he’s not Curly. I definitely prefer him over Joe. Pretty safe statement since if Ruiz doesn’t develop more power, he won’t have a major league career. Schimpf will be a great player to stash in AAA. But he’s got 14 hitless ABs and a putrid 2017, and I’m glad we have him, but would you even want to give him the 100 ABs at the major league level to see if his inevitable AAA success means he’s back to 2016 and is not going to revert to 2017? I think Camargo is a good risk, Gomez is a good risk, even Lane Adams is a good risk, but if they set sail with Schimpf as even a platoon guy and he likely struggles, then the FO was just begging for it. Put a real player on the field with that $11M they didn’t spend from last year. I wish Schimpf was a couple of years younger; most likely he’s already as good as he’s ever going to be. Still, they’re putting themselves in position to get lucky, which I support. Schimpf is worth taking a flier on. He would be only the 3rd guy on the roster who has ever hit 20 HR at the major league level, and one of the other 2 guys (Markakis) doesn’t hit for power anymore. Danny Santana CAN YOU FEEL THE small-sample EXCITEMENT??????? Schimpf is this year’s Joey Terdoslavich. Random potential 25th guy on the roster/AAA shuttle bait that people spend WAY too much time projecting on. If they break camp with Santana on the 25-man, I’m going to send them a sternly worded email. Yes I can. Watch me on the bases too. That series last year in Oakland I ran the show. It has to happen. If we are to go 162-0, Santana will be an essential cog in the wheel. They could just be waiting til the end of Spring Training to pick up somebody. If they feel like they have good pitching, who knows, maybe they feel like adding to the bench is worth it. Ryan Schimpf makes Jose Oliva look like Juan Francisco. @47 Start working on that email, now. For guys of Danny Santana’s caliber, Spring Training is the World Series. Do or die, sink or swim, kill or be killed. Danny makes the team, works hard to stay hot in April, eventually the league catches up with him, and he’s cut, finds himself on some crappier team’s bench or the minors or maybe nowhere at all. These guys are like Benjamin Buttons, living each season in reverse as their spots are claimed by the ascendant Austin Rileys and Kyle Wrights of the world. I stand in awe of it as the cycle plays out. It’s like watching Planet Earth. @47, Tweet your roster advice to the beat writers, they will send it right up the chain! Yesterday someone posted that Billy Hamilton when he gets on first base scores 44% of the time. Question. Acuna, how should he be so instructed? More likely on second in his case. Damage? Not as fast, no, but fast enough and on base a heck of a lot more often. @53 – don’t really understand the question. Are you asking if Acuna should be instructed to run/steal bases if he’s on first? Generally speaking, no. The down side of either getting caught or hurting yourself sliding is greater than the upside of that 90 feet. If the question is “should Acuna be waived home from 3B on 50/50 plays as he rounds?” Yeah, I’d say there you send him and test his young legs against most OF arms. You will enjoy, I promise. Alex, such is your fondness for this style of three’s company comparos I suspect you must maintain a detailed list of likely suspects you can refer to when a fresh name appears on these pages? Or, such are your powers of memory of character, performance and physical appearance in some cases, those two names are there instantaneously in your bank to offer up. In either event they’re fun. Sam, for not understanding my question you made a pretty good job of answering it. Thank you. I seem to think this team will run a lot. We’ve heard about Ender improving his baserunning/basestealing, we know Albies will run, and Acuna ran a lot last year. We’ll undoubtedly lose power, but we’ll gain a lot of extra bases either taken or stolen on the aggregate. Didn’t Acuna get thrown out half the time in the minors? Yes, but I definitely think he’ll steal and take more bases than his predecessor. Adam, yes, i ran into this yesterday there, where my 44 must have come from. The guy writes well, nice light touch, don’t know him.. I suspect unusually good baseball writers interest us both. Couple of weeks back i posed a question here as to why Ivan the Great continues to slumber in the penurious pages of TC. Silly handle apart IMO he is a mile above all comers and can do something very few can, provide detailed expertise of the highest order in analytics as well as in what i call real baseball, ha! He can be light, funny, politely censorious, self deprecating – that’s a rare mix. Why doesn’t someone higher up the National ladder pick him up, he has more than proved himself. Anyway, got no response here. You? Travis Sawchik came from the Pittsburgh Post-Gazette, I think. Agree, he’s great. Here’s where the real opportunity is… Someday, hopefully someday soon, one of these supremely talented baseball writers will be enterprising enough to do some (unsanctioned, at least at first) color commentary of actual MLB games (again, this would have to be on the sly) and share it with us online. I’m surprised DIY color commentary over an MLBTV livestream hasn’t happened, caught on, and forced some of the dinosaurs we put up with now on TV into retirement as networks poach the talent that emerges. Like, why hasn’t this played out yet? I believe this is actually a huge contributor to baseball’s aging problem. Whole generations’ worth of comedic sensibilities have passed the likes of Joe Simpson by. Millennials would absolutely watch baseball overlaid with something suitably absurd and in-jokey. We already populate comments sections and live chats with memes, Simpsons references, etc. Why hasn’t anyone figured this out? It’s crazy to me that MLB doesn’t get that it’s not the game that’s the problem, it’s the presentation of it. You could take this observation in the direction of Acuna’s cap, Jose Bautista’s bat, and Bryce Harper’s bid to become baseball’s Ric Flair. But MLB has a broadcaster problem, which to me is even more obvious. From the sound of it you’d be pretty good yourself. That you can bring the aging problem into this is fascinating- of course. Ivan maybe should be thinking that way. @64 MLB has multiple problems as it’s not just the broadcasts that stink. Although, Bryce Harper’s personality also doesn’t help. It probably wouldn’t be hard to sync a real-time podcast to the Braves television feed and do play by play against it. @67, Find yourself a Flava Flav-type of sidekick to balance you out and go for it. When you start earning, I’ll just take 10 percent off the top, and you’re very welcome! +1 for a MST3K version of Braves telecasts. I’d want to also keep the sounds of Chip and Joe in there as fodder to riff against. I know spring training stats are meaningless, but it’s cool that Atlanta’s prospects are doing well and the team has played well after a slow start. When is the last the Braves had a decent spring? @65 It would depend on whether the audience would like a slightly diminished southern drawl. My father always thought that that’s what I’d end up doing. When I was a kid, I used to make imaginary broadcasts onto cassette tapes. @70 several Braves have good Spring averages. The pitchers haven’t done quite as well. Ryan Schimpf makes Scott Thorman look like Mike Hessman. Maybe this will be fun. Pick one Brave that you think will exceed expectations/projections or just general sentiment and one that you think will fall short of them? For exceed, I’ll go with Albies (I’ll admit I think I was dead wrong on him) I’ll go with Swanson not even meeting mild expectations. And for bonus (laughs) one prospect you think will blossom for sure and one that you think will bust. @71 – I was thinking just the opposite on that. We lost some games early because we put in pitchers in relief that have a 0 to 10 percent chance of making the team. It is a small sample size and meaningless, but Vizzy, Soroka, Wisler, McCarthy, Folty, Moylan, Freeman, Kazmir, Teheran, and Minter all have an ERA of under 2. Many have not allowed a run yet. Agreed. Now that the relievers are getting cleaned out nicely, we’re just throwing legitimate pitching prospects who are knocking on the door, our starters, and our relievers. The pitching is rounding out nicely against the inferior hitting opposition. And aside from this generous helping of Jaff Decker, I’ve been excited to see Alex Jackson, Riley, and Ruiz get so many ABs. While there may not be position battles for OD on the table for Jackson and Riley, it’s been exciting to see the lineups like today: Albies/Swanson/Acuna/Riley/Ruiz/Jackson. I’d listen to a Sam and Chief broadcast. I’d probably listen to spike by himself. @75 good points some of the bullpen options seem to be narrowing and you’re right they’ve been better. Overall, pretty pleased with how spring is going, IMO. Rob, I just re-read this post. This is an excellent, even-handed article. Keep up the good work, and you’ll have no future whatsoever in print journalism. As all this would be remote as i understand it how about a weekly game or two hosted by a Brit color man? The point being smooth dulcet tones, a sense of Benny Hill humor and no danger of getting bogged down with too many facts/stats etc. Verse comments interspersed without warning, good old Georgia boys doing play by play in contrast, this one would run and run. be mixed with The Crown on its historic mission. Slow withering on the vine ..Swanson, hope i’m wrong. Miss…Riley..where are we going to play him? Of all the teams Fangraphs has done so far (10), other teams average less than one FV 55+ prospects. The Braves have 5. Of 50+ FV prospects, those teams average 4.3. The Braves have 11. And this does not include Newcomb, Albies, and Dansby. Of note, Cristian Pache has the same future value as Soroka, Gohara, and Wright. Also of note, Allard has fallen behind Soroka in this more objective way of valuing prospects. I was a big Allard guy originally as his HS highlights showed me what I thought was just electric stuff. My sense is that his slight frame (although he does look bigger in ST this year) is an impediment. I certainly am still high on him but not as. I think Soroka has some Josh Johnson in him. Not quite as tall but I think a good possibility.